The stock is above two key levels that favor continued strength if sustained before earnings. Streaming video giant Netflix Inc. (NFLX - Get Report) gapped higher this morning as the company announced it was raising its monthly subscription price to $13 on its 58 million U.S. subscriber base. Netflix closed Tuesday up 6.52% at $354.64. The stock opened at $349.60 and continued to as high as $355.50 as of 10:00 a.m. This pop of nearly 7% has it above two key levels that favor continued strength if sustained before earnings. Netflix is now above my monthly pivot at $342.10 and its 200-day simple moving average at $333.38 on its daily chart. The stock is also above a Fibonacci Retracement level of 23.6% at $342.32 on its weekly chart. Holding these levels going into Thursday's close targets my quarterly risky level of $379.93, but a new high appears unlikely at least in the first quarter. Going into Tuesday's trade, Netflix had a volatile ride, which is a concern that all good news has been priced into the stock for Thursday's earnings report. As of Monday's close of $334.22, the stock was already up 24.9% so far in 2019 and in a bull market 44.5% above its Christmas low of $231.23 on Dec. 26. Believe it or not, despite this strength, the stock was also in bear market territory, 21% below its all-time intraday high of $423.20 set on June 21, 2018. Does the current strong momentum mean the stock will continue its moonshot? What we know is that shares of Netflix are usually extremely volatile following an earnings report. Analysts expect the streaming company to earn 25 cents to 26 cents a share when they report after the close on Thursday, Jan. 17. Goldman Sachs recently opined that Netflix was the best buy in the Internet space. Are the huge gains so far in 2019 satisfying this call? Netflix believes that content is king. In 2019, the streaming video giant increased their spending budget and will be offering 90 different programs. Spending for fresh content anticipates that subscriber growth will continue. In 2018, Netflix spent about $3 billion on content and this pace should continue in 2019. The company debt is around $14 billion, which requires more revenue to service, hence the need to raise subscription fees. Netflix will likely offer more content and subscriber growth will continue as users sign-up sometimes just to watch a single series. The more content provided reduces Netflix cancellations. Canaccord Genuity issued its FANG update Tuesday morning. They see a strong outlook across the board as Netflix sets the stage for earnings and others will follow. Canaccord talked about Netflix's strong showing at the Golden Globes -- that bodes well for subscriber growth. The daily chart for Netflix shows the gap above its 200-day simple moving average at $333.35 and above the horizontal line that represents my monthly pivot at $342.10. This is the price zone that must hold going into the close Thursday before earnings are released. The horizontal line below the 200-day SMA is my semiannual pivot at $327.12. If strength continues, the upside is to my quarterly risky level at $379.92, the highest horizontal line. The lower two horizontal lines are my weekly and annual value levels at $280.93 and $217.12, respectively. 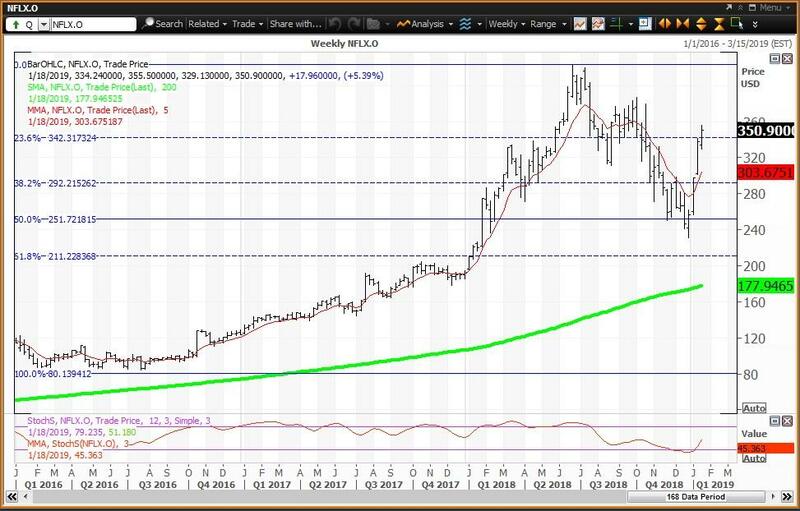 The weekly chart for Netflix is positive with the stock above its five-week modified moving average of $303.86. The stock is well above its 200-week SMA or "reversion to the mean" at $177.95. The 12x3x3 weekly slow stochastic reading is projected to rise to 45.46 this week up from 28.43 on Jan. 11. Note that when the stock was trading at its all-time high of $423.20 on June 21 the stochastic reading was above 90.00, indicating that the stock was in an "inflating parabolic bubble," which proved to be an accurate technical warning. 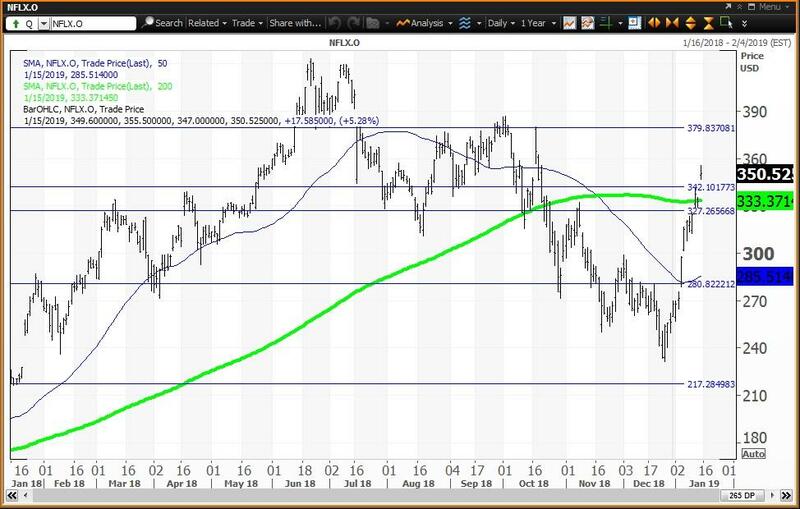 The horizontal lines are the Fibonacci Retracement levels of the bull market run from $79.95 in February 2016 to the high of $423.20 set on June 21, 2018. The stock is above its 23.6% retracement at $342.32. Given these charts and analysis, buy the stock if it slips back to my monthly pivot at $342.10 pre-earnings, which lines up with the 23.6% retracement of $342.32. Add to longs on weakness to my semiannual pivot at $327.12. This would be the setup for strength to my quarterly risky level at $379.92, where positions should be reduced. If the stock gaps below my semiannual value level at $327.12 on a negative reaction to earnings, the downside is to its 38.2% retracement at $292.22.